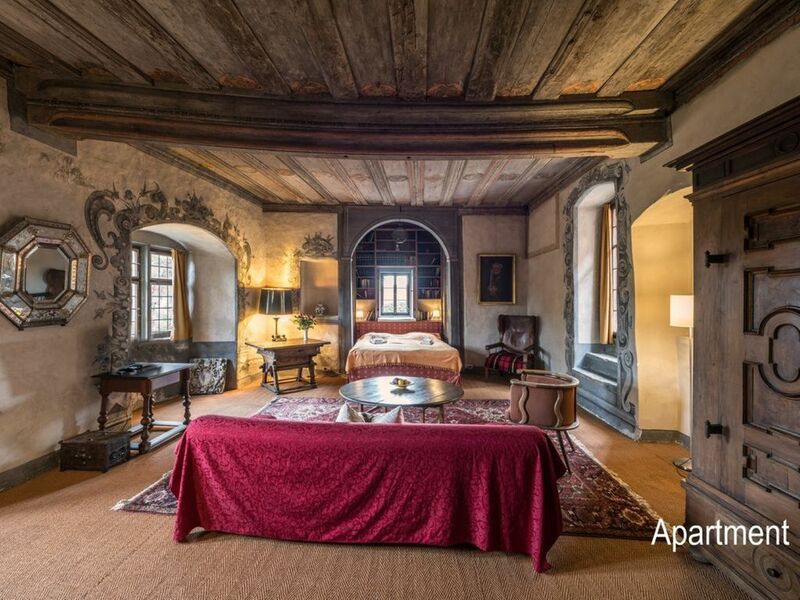 The exclusive castle apartment is located in the medieval wing of Schloss Unsleben. It consists of a very spacious living room (about 40 square meters), the 'Blue Salon', a small, modern kitchen with every comfort (coffee-pad machine, dishwasher, oven, microwave etc.) and a dining table, a original bathroom with double sink, bathtub and large mirror and a spacious entrance hall with elegant dining table. The apartment is a secluded unit in the castle, where guests can enjoy the overwhelming charm of the house completely undisturbed. Tranquility and the view of the charming landscape beyond the moat will quickly relax the tense guest. Our guests have at their disposal an idyllic seating area in the spacious and unspoiled castle garden on the outside of the Graben. Two loungers and a small table invite you to relax and enjoy in the shade of ancient trees. From here, the dormant guest sees the castle from its most attractive side with impressive half-timbered construction. Behind him are the lands belonging to the house. They invite you to long walks. The custom-made marriage bed has been artfully integrated into the library niche. The look on waking up goes over 400 years old ceiling painting on the old, defiant beams. The bathroom is unique in its architecture. It combines ancient walls with contemporary comfort. In terms of color, it is tailored to the Blue Salon. Washing machine use for a fee. Sehr schönes Ambiente zum Wohlfühlen und Erholen! Es war ein wunderschönes Wochenende in diesem sehr geräumigen Ferienhaus, der alten Brauerei. Sehr gut geeignet für größere Gruppen, auch mit Hunden. 2 Kinderbetten wie auch 2 Kinderstühle wurde problemlos von der freundlichen Vermieterin organisiert. Eine besondere Umgebung mit dem Wasserschloss rundet das nette Bild ab. Auch zu empfehlen ist die Gaststätte Krone im Dorf. Sehr kinderfreundlich. Wir haben die Zeit im Schloss sehr genossen und uns königlich gefühlt. Für alle, die ein bisschen Ruhe suchen, ist Schloss Unsleben perfekt geeignet - wir haben drei Nächte im Schloss-Apartment verbracht. Das historische Ambiente ist atemberaubend und flößt Respekt ein, auch vor der Arbeit von Gräfin und Graf Waldburg. Wir haben uns sehr wohl gefühlt und würden jederzeit wiederkommen. Raus aus dem Alltag und rein in längst vergangene Jahrhunderte. Ein echtes Kleinod! Es war eine wunderbare Zeit!!!! The moated castle is located in Unsleben, a village of 900 souls between Bad Neustadt / Saale and Mellrichstadt. It is quiet on the outskirts, but in a few minutes walk all shops (village shop, bakery, butchers, bank, doctor, pharmacy, dentist) of the village can be reached. When you leave the castle courtyard, you enter nature. Long hiking trails along the river Streu or over the hills of the Rhön invite you to take long and short trips on foot or by bike. The beautiful golf course Maria Bildhausen on the monastery grounds in Münnerstadt attracts the golf lovers (15 minutes drive away)! Trails and ski lift are around 20 minutes away by car (eg Wasserkuppe, Arnsberglifte, Zuckerfeld). The private castle garden invites you to rest and relax in the green. Historic walls surround an old family property that is second to none. Golf: The beautiful golf course Maria Bildhausen is a good 10 minutes drive away in Münnerstadt. Golfers will find there an 18-hole championship course and a 6-hole short course in the rolling hills of the Rhön. The special thing about this system is that even when you play 200 people playing golf at the same time, you get a sense of freedom when playing. ' The cleverly created fairways - two circular courses - make this possible. The golf course is the only one in the world owned and on the site of a monastery! Ski: From Unsleben the popular ski resorts in the Rhön can be reached in about 20 minutes by car. These include the Kreuzberg, the Wasserkuppe, Zuckerfeld etc. The ski and snow paradise Wasserkuppe also offers wonderful tobogganing, even a toboggan lift. Unsleben itself has a small luge slope, which allows a lot of fun for young and old.